This is a Jeep cake my son wanted last year. 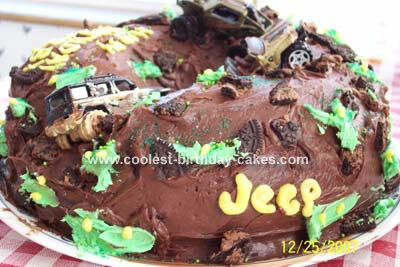 This cake is a bunch of Jeep hotwheels cars out having fun in the mud. I used a chocolate cake mix in a bunt pan. I cut a notch out of one side and stuffed it on the middle to fill the hole and cut some other places to rough it up. Its covered in chocolate frosting from a can and decorated with decorator frosting left over from another cake I just made. I smeared some extra chocolate frosting on the Jeeps. It was a bunch of fun and easy to make – the messier – the better. Great idea. I was looking for a Jeep cake for my 41 yr old husband. He’ll love this. I love baking cakes for my family and friends. And we are all rednecks, so this cake is perfect ! Thank you soo much for making something like this that I can base a cake off of ! You rock !